The RKC Florida Strikes Back! The Trilogy! RKC Florida Strikes Back! The Trilogy! NO BOOTH FEES~ bring your banner, be courteous and take only the space you need for the dogs you bring! First Come First Serve. FLORIDA’S RKC PRESENCE IS HERE TO STAY! Show #1 starts at 11:30am. Back to Back to BACK! The Trilogy! The team touches down in Florida again October!We are happy to offer FREE permanent registrations to all dogs participating in the days conformation event! 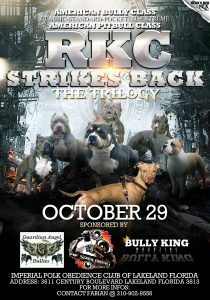 Myself as well as other trusted members of The RKC will be in attendance to meet and greet as well to answer questions! All dogs must be RKC registered to show in RKC show, You must bring a COPY of your current registration papers, or registration Id card (UKC, ABKC, ADBA). If you do not have this with you, you will have 10 days to submit them for applicable points to be awarded. Day of show entry is $25 per dog. Save time and money, preregister your dog(s) now. You DO NOT need to pay in advance to receive the $5.00 savings for pre-registration! Below you will find our on-line pre-registration form. You will need to fill out and submit for EACH dog you have paid for. After completing and “submitting” each form, the page will re-load and you will notice”Your form was successfully submitted” message just above your form assuring its submission. Repeat the process to add any remaining dogs. If you need to apply for permanent registration for a dog attending please continue to the following section after you have completed your Pre-registration(s). If you do not need to Apply for permanent registration on dogs attending this event at this time this completes your transaction. We urge you to follow post on our Facebook Events page, those “attending through the event page will receive confirmation of your registration there. RKC Florida Strikes Back! The Trilogy! *Online Permanent Registration for his event is experiencing temporary technical difficulties! You can apply for Permanent Registration at the Saturday’s Event. Thank you for your patience and understanding. We urge you to follow post on our Facebook Events page, those “attending through the event page will receive confirmation of your registration there. RKC Florida Strikes Back! The Trilogy! I Understand that this is an Application for Permanent Registration and I Understand to qualify for FREE registration, I must have competed or will competing in an upcoming event that is offering FREE registration. Please bring or mail in a COPY of the FRONT and INSIDE pages of your pedigree. RKC Florida’s Back 2 Back Bully Showdown! Four Paws Down January 14th 2017!